The Hamuel 3F-TB milling machine is specially designed for the efficient milling of finger-type and fir-tree roots of turbine blades. 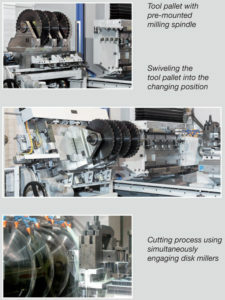 This triple-axis CNC vertical milling machine has a horizontal drive spindle that drives the disk milling cutters positioned on the milling spindle. The machine base and stand are heavy, rugged welded construction. It’s also equipped with pre-stressed bearing/roller guides for linear slide movements. 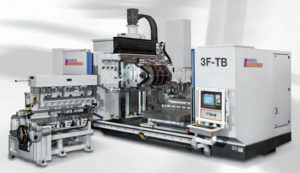 The 3F-TB increases productivity 70% over conventional machines. The core of the machine is the exchangeable tool drive unit which allows the use of different machining heads for precision machining of different part features. Special heads for different milling applications are set-up outside the machine and interchanged automatically by a head changer as needed. The blade milling machine is equipped with a head changing device which automatically changes milling heads for different milling processes. The Hamuel HSTM1000 is available for demos in our Peabody technical center. Call INIRAM at 978-854-3037 or email us to schedule a demo for your CNC milling and turning application.